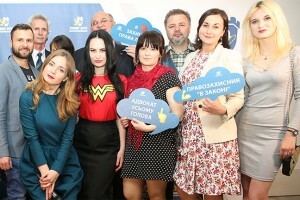 Klymenko together with American athlete and varenyky congratulated Ukrainian women on the International Women’s Day ⋆ News ⋆ Official website for Oleksandr Klymenko. Oleksandr Klymenko, the politician, the leader of the “Uspishna Kraina” party, taught the legend of American bodybuilding to speak Ukrainian and make “varenyky” to congratulate Ukrainian women on the International Women’s Day. The politician published congratulation video on his pages in social network. In this congratulation video Klymenko together with Vince Taylor are preparing festive dinner with Ukrainian varenyky as a main course. They are discussing the beauty of Ukrainian women. American bodybuilder is agreeing with the politician and begins to read a poem in Ukrainian describing Ukrainian women with such words as: “beautiful”, “incomparable”, “unfathomable”. During the serving the festive table, Klymenko continues the poem. Greetings from the Ukrainian politician and American bodybuilder is gaining popularity in social networks. Moreover, it has already got more than 80 thousand views. “We strive to constantly surprise and delight you. For instance, Vince Taylor – my friend and legend of American bodybuilding – has been learning Ukrainian for two years. Nowadays, he has managed to make varenyky. In my opinion, he is doing very well! “, – Klymenko wrote in his congratulations to Ukrainian women. Vince Taylor – is a famous American bodybuilder, who became a bodybuilding icon. During his career, he took part in 65 tournaments and won 22 of it. Taylor holds the record for the most Masters Olympia titles with five and got a Guinness world record with the amount of professional wins. Let us recall, earlier Klymenko argued against the decommunization of Ukrainian holidays. He stated that the initiative of the authorities on cancelation of March 8 is an “idiotic initiative.” Last year’s congratulation was also recorded with Taylor. That time, the politician and athlete read the poem from the “Kohaite zhinku” poetry collection by Stepan Halabarda in honour of Ukrainian women.